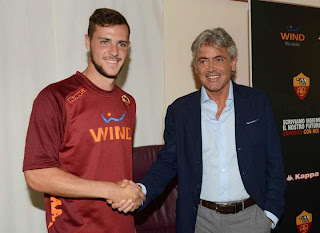 After leading Roma to their third historic Scudetto in 2001, Franco Baldini’s controversial return to the Lupi means he faces an even bigger pressure to succeed but so far he has done well. Rossella Marrai takes a look into the ‘Baldo evolution’. "I do not know [why I returned], but I immediately said yes. There was no reason for me to leave London and come here where many people did not want me. I said yes and that's it,” divulged Baldini on upon his return to Roma. Brought into the capital club in 1998, Franco Baldini was handed the tough task of turning the constantly underachieving Roma into a success and he managed to do so within his third year at the club. After finishing outside the top three in his first two seasons, the Reggello-born sporting director took action and sacked Zdenek Zeman at the end of the 1998-1999 season; replacing him with Fabio Capello. "I chose Capello to win and to provide the change that the fans expect. Capello is a winner and I believe this,” Sensi’s daughter, Rosella Sensi, noted upon his arrival. Capello’s and Baldini’s joining of forces would be a match made heaven as it erupted the start of a long and fruitful career path together.